A few weeks back we quoted a large solar installation where either gravel would have to be spread around the panel mounts or fabric laid down. This would keep the weeds and grass around the panels much more manageable. While looking at the site it was suggested that sheep could be used to keep the grass trimmed. I had a good laugh at first. Then… it hit me! It really was a simple yet terrific idea that supports both agriculture and renewable energy. What a great legacy for the farming community and education sector. The array is completely fenced in and the area would only have to be a grazed twice a year for two weeks each time. Advantages include saving $20-25,000 and the array may operate cooler not having the gravel bed as heat retention. The ground would also absorb and utilize more rain water without the fabric. 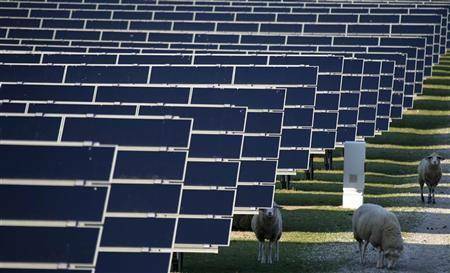 Of course using sheep to keep things looking nice is nothing new (at least I know that now) but I hope it continues to be used more and more with solar energy arrays.